Nothing says Thank You better than a bunch of fresh flowers! Large 18&apos; Helium Balloon included. This beautiful collection of deep water roses, chrysanthemums, carnations, germinis, and thlaspi make the perfect gift to show your appreciation. 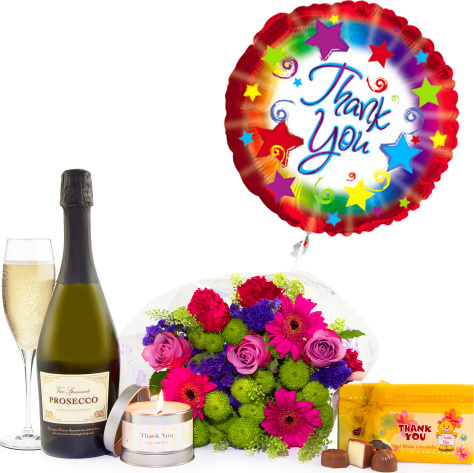 Available for UK next day delivery, we have also included a 75cl bottle of Prosecco, a Thank You candle, a 130g box of Thank You chocolates, and a large helium filled balloon to top it all off! There&apos;s no denying that this is a gift that will make the lucky recipient smile from ear to ear!